Legend tells of a huge bird called the Thunderbird. Its origin remains a mystery, even to Native Americans. According to myth, Thunderbird was so large and flew so high, it carried the rain on its back and created thunder and lightning. Perhaps Teratornis merriami was the creature that inspired the myth. Probably the largest bird ever to fly, it died out following the last ice age. For a short time, thousands of years ago, the bird shared territory with early Native Americans. To make a gift to BirdNote, begin here. Thanks! 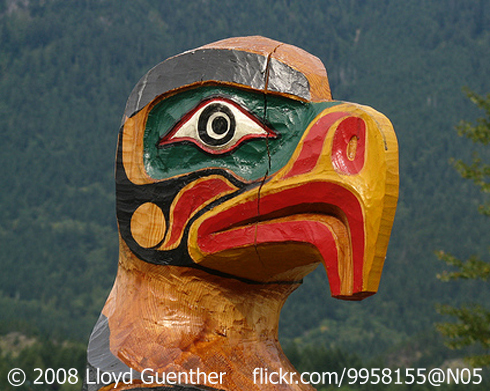 Bird myths are common in Native American folklore and history. In most, the species, or at least the family, of birds can be identified. But there is one myth – that of a huge bird called the Thunderbird – whose origins remain a mystery. Thunderbird was revered by many tribes throughout the West. According to the myth, Thunderbird was so large and flew so high, it carried the rain on its back and created lightning and thunder. Researchers looking for Thunderbird’s identity turned to the California Condor, the largest bird in the West. But the condor was well known to many native groups. It would not have been a mystery. One intriguing theory suggests the memory of a much larger vulture may be the basis for the myth. Teratornis merriami, possibly the largest bird ever to fly, known only by its Latin name, died out following the last ice age. Yet for a short time, thousands of years ago, that bird shared territory with early Native Americans. Could Teratornis merriami be the creature that inspired the myth of Thunderbird? Writers for BirdNote include Frances Wood, Bob Sundstrom, Todd Peterson, Dennis Paulson, and Ellen Blackstone. The producer is John Kessler, and the executive producer is Chris Peterson. I'm Michael Stein. Thunderstrom recorded by C. Peterson at Lake Nippissing, Ontario.